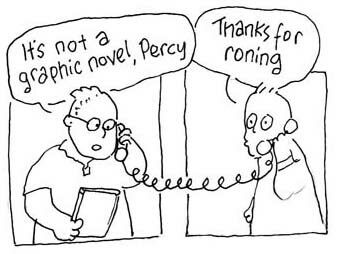 Eddie Campbell: It's not a graphic novel, Percy. It's not a graphic novel, Percy. First person to ask for it in the comments can have that little Campbell drawing signed (I've only just noticed it's unsigned but I'm not rescanning it) and sent to them. If you don't want to leave a street address, give some way of opening email contact. When "It's not a graphic novel, Percy" becomes the catchphrase on everybody's lips and t-shirts over the next few months you can say you have the little sketch that started it all. When I give a reason above for blogging, I naturally understand that there are much bigger forces at work that subject little folk such as me to 'the nihilist impulse'. Breach has just drawn my attention to Geert Lovink's interpretation of the blogosphere: "Blogs bring on decay. Each new blog adds to the fall of the media system that once dominated the twentieth century. What’s declining is the Belief in the Message. That’s the nihilist moment and blogs facilitate this culture like no platform has done before." I can go for this. I've always believed in a kind of nihilism as a postive thing, the throwing away of the crutches, of naive credulity. Eddie, you've got a great thing going here. I'd definitely love to have that drawing - it's cute. You can reach me at pounce@gmail.com and I would be glad to give you my address. I'm also going to give that review a look. Hey, any chance of a complete collection of Bacchus? I'd love to see that happen. Maybe an Absolute-style treatment would work for that. Anyways, glad to have you around the blogosphere. It's a much better place with you in it. Bloody hell, I just clicked on the first archived web page and found out that we we selling DeeVees 5 to 11 for 70% off! Yes. Collected Bacchus, please. One of the funniest comics ever. Goddammit, too late to get my OWN catchphrase in my very own Eddie Campbell drawing. Ah well. I'm going to ask for royalties. Of course, I don't know what a Graphic Novel is. But I do think Fate is more of a ... hmm... illustrated novella? That's semantics, really. I don't know, but I just felt that it didn't sit awfully comfortably with the other books that firstsecond sent me at the same time, almost all of which I could look at and say 'Graphic novel in the widely accepted sense of comics', whereas yours I couldn't. What a nice thought to finish a bad week upon. more on nihilism and chaos coming up , and we're not finished with percy either. Eddie, I'd be really interested to hear what you reckon the four mutually exclusive uses are (and I can't find WLR online). "Graphic Novel" is a term I really try to avoid as, except maybe for some of Will Eisner's stuff and Lynd Ward's woodcut novels, it seems to be mainly a bit of marketing speak. The amount of times people have said that they really liked a comic and followed it with: "But that's not a comic, its a graphic novel." Presumably because reading comics is below them, but I guess at least it gets them reading 'em. Grrr. Ben. I thought somebody was bound to ask. I intend to get back to that one shortly. Meanwhile, you can just keep arguing in the pub.